Elegant silver aluminium ASUS VivoBook V551LA-DS71T is a 15.6 inch touchscreen super slim notebook with Windows 8, the latest Haswell Intel i7 processor for speed and power, modern chiclet keyboard, an optical drive despite the slim body, HD quality LED backlit widescreen touch display that is 150% more responsive than the industry benchmark and superior sound quality through the large speakers and Sonic Master technology. 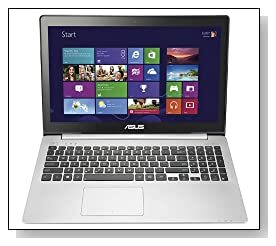 ASUS VivoBook has a 4th generation Intel dual-core i7 4500U (4MB L3 cache) at 1.8 GHz CPU, 8 GB DDR3L SDRAM memory, 750 GB hard drive at 5400 rpm and Windows 8 operating system.. The i7 processor is both powerful and energy efficient with enhanced battery life- being 4th generation and the 1.8 GHz speed can go up to 3.0 GHz with the Intel Turbo Boost 2.0 when you work on tasks that require more speed, automatically balancing the energy efficiency and speed. It also has the Hyperthreading technology that enables dual cores act like quad cores for much better performance and multitasking. Large 8 GB memory lets you multitask super efficiently- open and run many apps and browsers at once with no delays, 750 GB hard drive offers you a good amount of space to save your photos, movies and songs, 32 GB Asus cloud based WebStorage gives you access to those files that you need when you're away from your computer on another laptop or a mobile device on Asus' secured network and is free for three years, Asus Super Hybrid Engine II offers up to 2 weeks of standby and the ability to wake the system up from hibernation in a couple of seconds and the auto back-up function saves your work when the battery goes below 5%. The 15.6 inch glossy LED backlit HD wide display with 16:9 cinematic aspect ratio, 1366x768 native pixel resolution and intel HD Graphics 4400 gives you vibrant colors and outstanding picture quality on its touchscreen where you can tap directly on the tiles of Windows 8 or click on them with your mouse / touchpad or keyboard. The Splendid Technology enables the system to arrange the image settings automatically to whatever you're doing- movies, photos or surfing the net to give you the best outcome. You'll get 'the best quality in its class' audio- deeper bass, improved vocals and very clear true-to-life surround sound with the Asus Sonic Master technology and AudioWizard software with its five selectable modes via the larger integrated stereo speakers and resonance chambers. 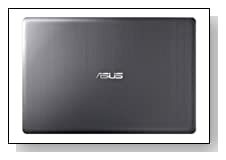 Hairline textured minimalist metal design silver aluminium ASUS VivoBook is only 0.80 inch thick and weighs 5.3 pounds. The lithium ion battery offers around 5 hours of battery life on average use. The chiclet style keyboard with 10-key numeric keypad is ergonomic and comfortable helping you type accurately, with minimum errors. It has a SuperMulti DVD drive despite its slim frame as well as 2 x USB 3.0 ports, 1 x USB 2.0 port, Bluetooth 4.0, 802.11b/g/n wireless, 10/100/1000 MPs Gigabit Ethernet with RJ-45 jack, a Secure Digital media card reader, an HDMI port, a headphone/microphone combo and a built-in HD 1080p webcam with microphone. Conclusion: Asus Vivobook V551LA-DS71T is an ultra slim and stylish premium brushed metallic texture laptop PC that is loaded with superior features with great performance. What makes it stand out most from the crowd is its beautiful design with thin frame, but it certainly is not just pretty. Vivobook comes with a top of the range Haswell i7 processor, generous amounts of memory and hard drive, outstanding sound with large speakers and great picture quality on its responsive touchscreen, ergonomic keyboard with 10-key numpad, all at a reasonable price. It is certainly not ordinary and seems to be one of those computers that overdeliver- great value for dollar!